Rev. Deborah Elandus Lake is the executive director of Sankofa Way Spiritual Services, Inc., a 501 ( c ) ( 3 ) organization that creates new approaches to addressing oppression within the intersection of racism, homophobia, and sexism. Before making a full-time commitment to developing Sankofa Way in 2004, Rev. Lake was chaplain at the Ruth Rothstein CORE Center, RUSH University Medical Center both in Chicago, IL, and Baystate Hospital in Springfield, Massachusetts. She was also the pastoral assistant for North Church UCC in Amherst, MA and the Director of African/American Outreach for the Metropolitian Community Church in the city of New York. Lake produces television programs and Pod-casts that help facilitate community discussions about ethics, sexuality, racism, homophobia, and bigotry. She speaks at community events for governmental reform, and is a long-time advocate of civil rights for lgbt people. 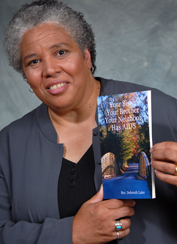 Lake is the published author of Your Sister Your Brother Your Neighbor Has AIDS, a book to help caregivers and family members recognize and care for people newly diagnosed with HIV or AIDS. She is the creative and organizing force behind, Black LGBT & Allies for Equality and Living In Fear/Freedom Every Day ( L.I.F.E. ) . Lake earned a Master of Divinity at Union Theological Seminary in New York, NY, has completed two years of clinical training accredited by the Association of Clinical Pastoral Education ( ACPE ) , and has provided spiritual care to people living with trauma, mental illness, and domestic violence for many years. She has training in trauma through the National Organization for Victims Assistance ( NOVA ) , is a Red Cross HIV/AIDS instructor specifically for the African/American community, and has been invited to be part of the newest initiative of Sidran’s Risking Connection, a program developed to help religious leaders and pastors recognize and address trauma in their work with congregations. New programs from Sankofa Way include the Change discussion series: http://change.sankofaway.org, Sankofa Tube: http://www.youtube.com/SankofaWay, and Faith Beyond Religion: http://www.wowwomensworld.com/podcast.php.